Home Health Care Policies - The home health industry has undoubtedly seen a recent boom in chain expansion. For many agencies, it’s a tactic for survival rather than profit. A recent report by Irving Levin Associates has confirmed that mergers and acquisitions in home health agencies spiked as much as 27% during Q4 of 2014, breaking any current records. One of such acquisitions was the $1.8 billon dollar merger of Kindred Healthcare and Gentiva health services. The observable 27% increase in M&A (mergers and acquisitions) activity increased from 15 deals in the third quarter, to 19 in the fourth quarter just in the home health and hospice sectors alone. Overall, the health care sector saw 345 transactions announced in the fourth quarter, setting a new record from the previous 318 transactions in December of 2012. Irving Leven Associates publishes information regarding senior care investments and regularly publishes information regarding stock prices, as well as property values for such facilities. For some agencies, acquisitions have not yet reached desirable returns. “The biggest disappointment in 2014 was Kindred Healthcare (NYSE: KND). After a sector-leading price increase of 82% in 2013, it dropped by 7.9% in 2014 and closed just above its 2014 low of $17.59 per share on February 5. It wasn’t all bad news during the year, as the stock jumped by 52% from that low in early June when Kindred was in the middle of bidding for Gentiva Health Services (NASDAQ: GTIV), which it finally won at a much higher price. Broken record and all, we still believe that Kindred is the most undervalued company in the sector. Ten years ago, it was one of the largest skilled nursing operators in the country. 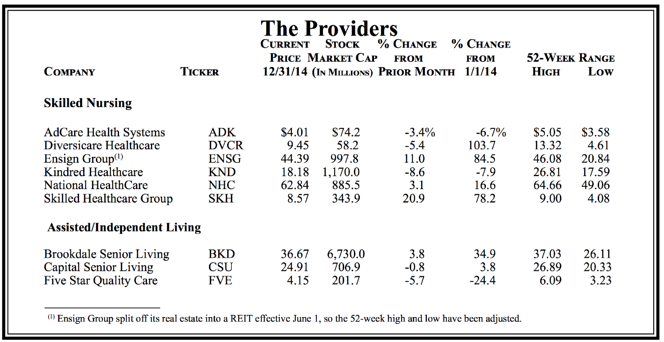 Now, its LTAC, rehab and home health and hospice businesses dwarf its SNF business, which has been shrinking rapidly to just under 100 facilities, including an end-of-year announcement regarding the transitioning of nine more SNFs that are leased from Ventas (NYSE: VTR) which do not meet KND’s strategy for the future. The SNFs have 903 beds and $65 million in annual revenues, but the rent is about $10 million, which we suspect is not covered by current cash flow. As part of the agreement, if operations of these facilities are not transferred to new operators by the end of 2015, Kindred’s rent will be cut in half until they are transferred. In addition, Kindred will make a $40 million payment to Ventas this month as part of the agreement, which includes funds for deferred capital expenditures for previously transferred facilities, and there will be other modifications to the existing master lease as well.